Audiobooks forever changed the way people read (listen to) books in their free time. Where earlier you used to sit on a comfy chair, bed in my case, and read a book by the table lamp, people are now listening to the very same books while jogging, cycling, and even driving. It saves a lot of time and allows you to be more productive when doing menial tasks that can be boring as hell. Gardening, anyone? If you own an iPhone or an iPad, there are some really good audiobooks apps available on the App Store to help you with this. Let’s take a look at some of the best audiobook apps for iPhone users and see how they differ from each other. Let’s begin. The first and the most obvious choice for most iPhone users is Apple Books, previously knowns as iBooks. 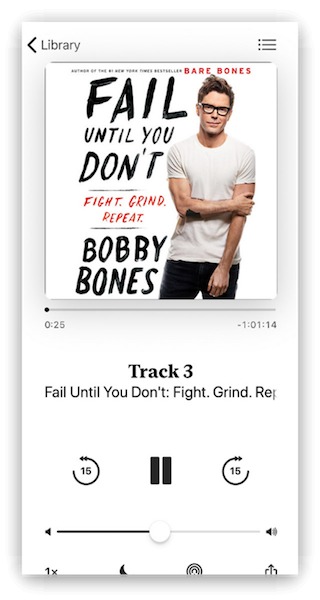 The default audiobooks app comes pre-installed on all iPhone. Apple Books not only supports eBooks but also offers a nice collection of audiobooks. Audiobooks were part of the Music app before it was moved to Apple Books for better management. Apple Books was redesigned a few months back and though it is a good place to discover and listen to new audiobooks, it is available in select countries at the moment. This limited reach is something that authors would also consider before making their work available on the platform. There is no subscription in place and you can buy any audiobook you like. Once bought, you own it. 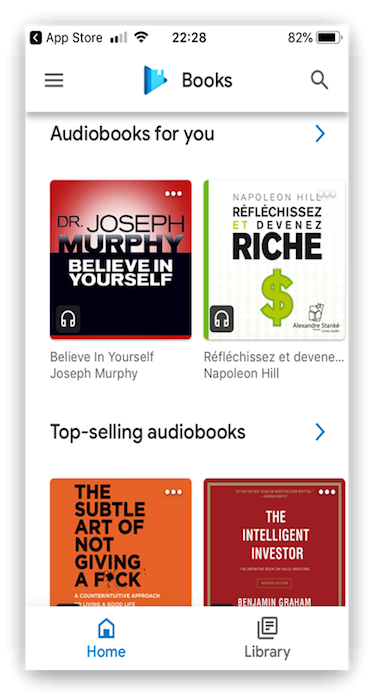 Audible, owned by eCommerce behemoth Amazon, is one of the best audiobook apps for iPhone users out there. They have a large collection of audiobooks that you can easily sync with the cloud. Audiobooks bought from Audible can be easily synced with your iTunes account. 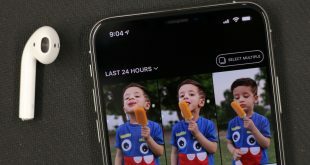 The app is very functional with features like bookmarks, the ability to skip or select particular chapters, background playback, and ability to control playback speed. Some people like to listen to audiobooks at 1.5 speed to save time and increase productivity. Audible has also partnered with celebrities which means you can hear your favorite celeb narrating their favorite stories on the platform. This is a unique feature. Audible has around 180k audiobooks under its belt and will cost you $14.95 per month. You get 1 audiobook every month for that. Whispersync users can switch back and forth between ebooks and its audiobook version easily. Librovox, unlike Audible, is a free resource for listening to audiobooks on the Internet. The initiative has gained momentum since its launch in the year 2005. There are about 50k audiobooks available in the free domain that were read by individuals from across the web. The app supports downloading these audiobooks in over 30 languages. You can easily find classics like The Art of War by Sun Tzu, Adventures of Sherlock Holmes, Pride and Prejudice etc. The app itself is easy to use with no need to register for an account. If you want to keep your library and progress in sync, you can sign in using your Google account. DRM is a much-debated issue in the world of audiobooks. Popular apps like Audible don’t support it leaving the users little option but to use their proprietary software for listening to audiobooks. This is where Bound comes into the picture. Bound supports all popular cloud storage platforms like Dropbox, Google Drive, OneDrive, and iCloud. 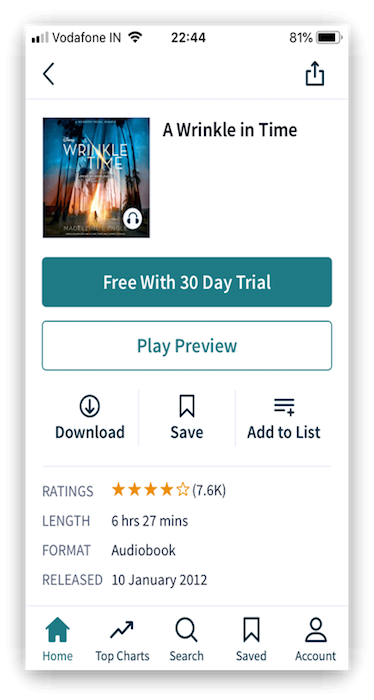 Once you have connected the app, it will automatically sync all the audiobooks store there. 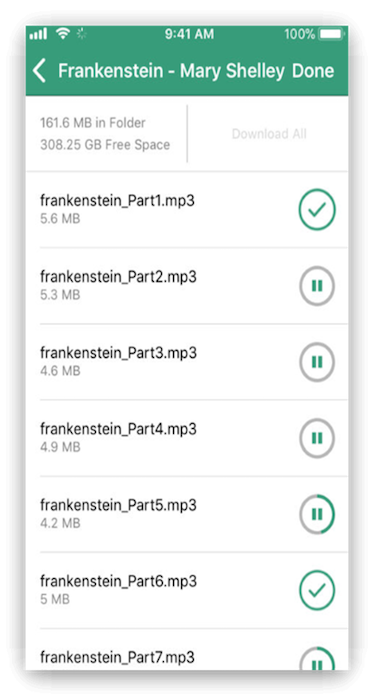 You can upload any DRM-free audiobook and listen to it. 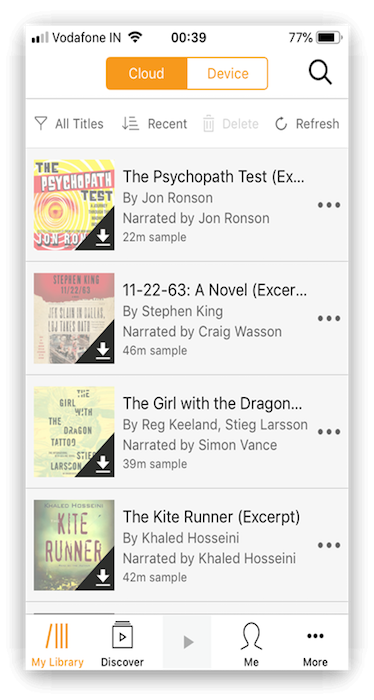 You can also upload audiobook content from your local library or downloaded from Librivox. The UI is neat and easy to navigate with features like bookmark, skip & rewind, control playback speed for fast listening, and sleep timer. Bound will cost you $3.99 and comes with no ads whatsoever. 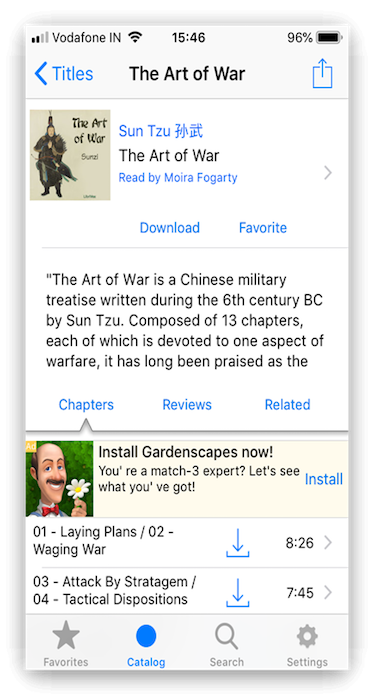 Bookmobile is one of the best audiobook apps for iPhones. When you launch the app for the first time, it will guide you through the UI which is itself pretty straight-forward to use although a bit cluttered. You can search for audiobooks on iTunes and Librivox from right inside the app. No need to visit either of the platforms. This saves time and streamlines the process. 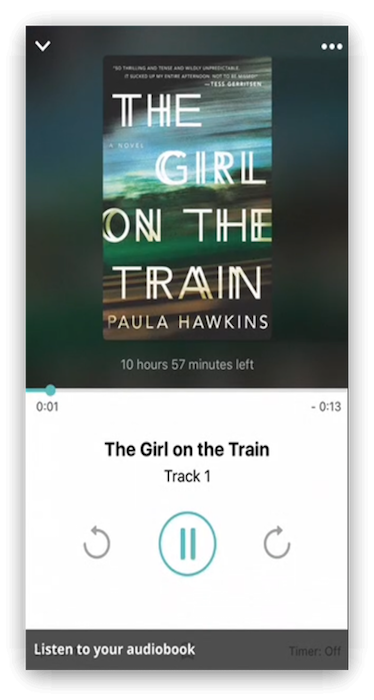 Just tap the ‘+’ icon at the bottom of the screen to begin adding audiobooks. 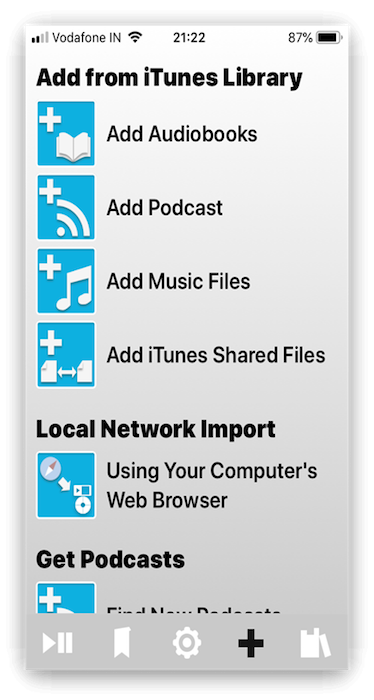 If you have DRM-free audiobooks on your iPhone, you can easily import it. Most people, myself included, use desktop or laptop to download content. Bookmobile understands this and comes with LAN support to help you import audiobooks from your computer. As if all of this was not enough, the devs behind the app also added a podcast player to the app. There is also a search bar to help you search for popular podcasts like The Daily by The NY Times. You can also control playback speeds and reorder episodes. Another notable feature is auto-bookmark where the app will remember where you left in case of a call, message, app switch or app crash. Oh, and you can add notes to bookmarks. 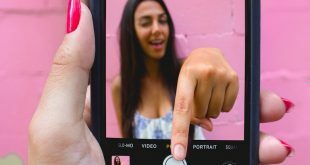 The app will cost you $3.99 after the 60 day trial period ends. Do you like listening to audiobooks published by indie authors? If you do then you are going to like Libro. They have a business model that is very similar to that of Audible. The first month will cost you just $0.99 after which, you have to pay $14.99 every month per audiobook. Each additional audiobook will cost 30% less. They have a strong collection with over 100k audiobooks and support DRM-free content as well. The good thing about buying credits from Libro is that, unlike Audible, they never expire. Libro is working with over 270 indie bookstores to bring you the best of audiobooks at your fingertips. Not everyone is a fan of the subscription model. A lot depends on your reading habits too which is why Libro will allow you to buy individual audiobooks too. Those who are looking for an Audible alternative should try Libro once. Audiobooks.com is a mixed bag with quite a few classic audiobooks available for free and 100k premium audiobooks that you can sync and listen to after subscribing for $14.95/month. Again, just like other big players in the audiobook niche, the first audiobook is free after which you get 1 audiobook a month. You can buy additional credits. Travelers will be happy to know that you can download audiobooks for offline listening. You can bookmark and add a note for later reference. The UI is easy to navigate and browsing audiobooks is a joy. You can browse by genre or keyword. 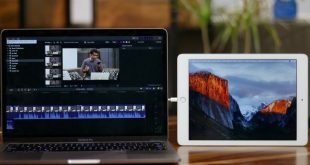 Other app features that you would expect like playback speed control and skip back and forth are all there. 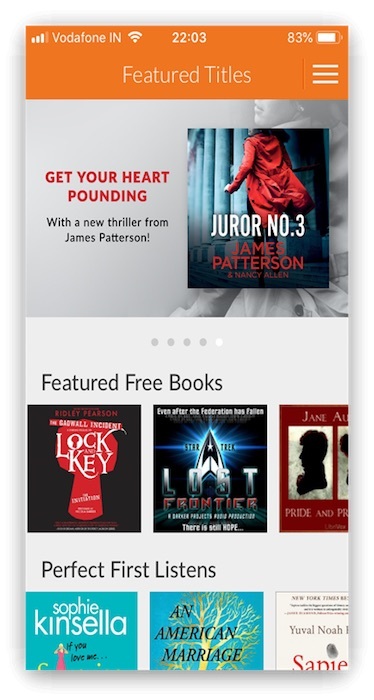 A surprise entry is the Google Play Books that is also available on the iTunes. Unlike the newly revamped Apple Books, Play Books has no geographical restrictions in place. Google added support for audiobooks at the beginning of this year. A great alternative for someone who has just moved his/her base from Android to iOS. Play Books has no subscription model in place. You can buy any audiobook you like and once purchased, you own it. Play Books not only works on iPhones but also in the web browser. Just sign in using your Google account. Any bookmark and notes that you take will be synced to your Google Drive account. Other app features like the sleep timer, playback speed control, and jump back and forth are all there. Play Books will let you see chapter names instead of track names at the time of listening audiobooks. Some other apps name them like Track 1, Track 2, and so on. This can be frustrating for some listeners. Also Read: Amazon Audible vs. Google Play Audiobooks: Which One to Choose? One of the most popular audiobook apps for iPhone users and a true Audible competition in my opinion. You see, Scribd offers an unlimited plan that is generously priced at just $8.99 per month. For that, you can listen to as many audiobooks as you like. Not only that, but Scribd is also home to eBooks, magazines, and newspapers from around the world. Note that the unlimited plan will be throttled if Scribd feels you are listening (and reading) too much. I think it is still better than some other subscription models we saw earlier in the post. The app is equally good with features like offline listening, bookmarks, and notes. There are quite a few options available when it comes to audiobook apps. Let me help you narrow down. If you are looking for the biggest collection and want celeb input, go for Audible which has become an industry standard. If you want something cheaper but equally good, you can’t go wrong with Scribd. Scribd also features other forms of content which is an added bonus. If you need something free and love classics, I would recommend Librivox. Bound will cost you one time but is far better than Librivox and also supports cloud storage and iTunes. Bookmobile falls in the same category. If you are a fan of indie publishers and want to support them, Libro.fm is where you should look. Finally, if you are not a fan of the subscription model then Google Play Books is for you. It is available worldwide and the audiobook collection keeps getting better.